Enrichment designs are described either in Phase II or Phase III clinical trials, and involve randomizing only the biomarker-positive patients and comparing the experimental treatment versus the standard treatment only in this particular biomarker-defined subgroup. Useful when we aim to test the treatment effect only in biomarker-positive subgroup for which there is prior evidence that the novel treatment is beneficial, but the candidate biomarker requires prospective validation. Useful when it is not ethical to assign biomarker-negative patients to the novel treatment for which there is prior evidence that it will not be beneficial for this subpopulation, or that it will harm them. 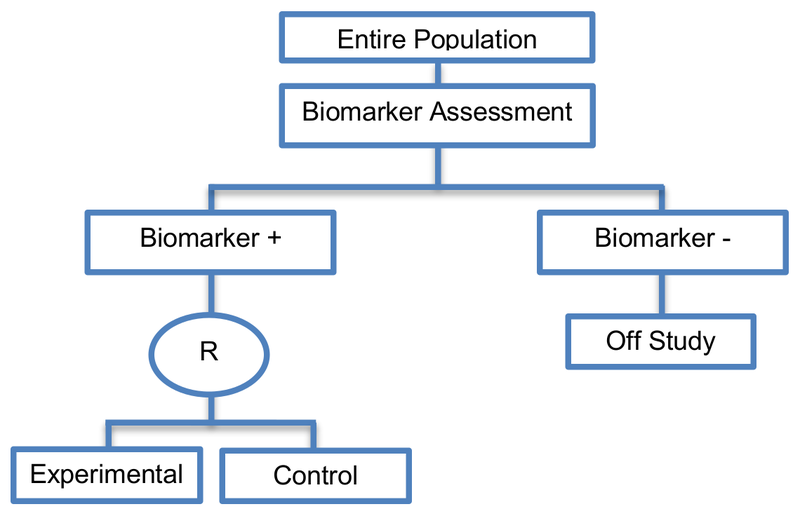 Recommended when both the cut-off point for determination of biomarker-status of patients and the analytical validity of a biomarker are well established. An online tool has been developed by Zhao and Simon that allows sample size planning for the enrichment designs both for binary and time-to-event (survival) outcomes, and is available at http://brb.nci.nih.gov/brb/samplesize/td.html. is referred to the expected number of events per treatment arm (time-to-event outcome), corresponds to either the experimental or the control treatment group, ratio between the two treatment arms (experimental:control) is assumed, corresponds to the event hazard rate, is the loss to follow-up rate, denotes the accrual time, patients enter the trial according to a Poisson process with rate per year over the accrual period of years, τ corresponds to the follow-up period. is referred to the required total number of events (time-to-event outcome), ratio between the two treatment arms (experimental:control) is assumed, denote the upper - and upper -points respectively of a standard normal distribution, and denote the assumed type I error and type II error respectively, denotes the assumed hazard ratio between the two treatment groups (control vs experimental) in the biomarker-positive subgroup. is referred to the required number of patients per treatment arm (binary outcome), ratio between the two treatment arms (experimental:control) is assumed, and are the response probabilities in the experimental and control groups respectively, . is referred to the required total number of patients per treatment arm (continuous response endpoints), ratio between the two treatment arms (experimental:control) is assumed, denotes the anticipated common variance, and the mean responses for biomarker-positive patients in the experimental and control treatment arm respectively. is referred to the required total number of patients per treatment arm (continuous response endpoints when accounting for error in the assaying of the study population), ratio between the two treatment arms (experimental:control) is assumed, measures the accuracy of the assay and corresponds to the PPV (positive predictive value of the assay, i.e., the proportion of patients who are assigned biomarker positive status according to the assay who are truly biomarker positive), is the treatment effect in the biomarker-positive patients and (where is the treatment effect in the biomarker-negative patients). Evaluate the effect of the experimental treatment in the biomarker-positive subgroup in a simple and efficient way. Provide clear information about whether the novel treatment is effective for the biomarker-positive subgroup, thus these designs can identify the best treatment for these patients and confirm the usefulness of the biomarker. Reduced sample size as the assessment of treatment effect is restricted only to biomarker-positive subgroup. Therefore, if the selected biomarker is “biologically correct” and reliably measured, the used enrichment strategy could result in a large saving of randomized patients. Enable rapid accumulation of efficacy data. Avoid potential dilution of the results due to the absence of biomarker-negative patients. For example, if the design had included the biomarker-negative population and the biomarker positive prevalence was low as compared to the biomarker negative prevalence, then the estimation of the overall treatment effectiveness could be diluted as it would be driven by the biomarker-negative subgroup. Can be attractive in terms of speed and cost, meaning that patients are provided with tailored treatment sooner. Do not assess whether the experimental treatment benefits the biomarker-negative patients, thus we cannot obtain information about this subgroup. Unable to demonstrate whether the targeted treatment is beneficial in the entire study population. Do not inform us directly about whether the biomarker is itself predictive because the relative treatment efficacy may be the same in the unevaluated biomarker-negative patients. Since these designs only enrol a subgroup of patients, they do not allow for full validation of the marker’s predictive ability. For full validation, a trial would need to randomize all patients in order to test for a treatment–biomarker interaction. Researchers should carefully consider whether or not to follow this strategy as it may be of limited value due to the exclusion of biomarker-negative patients. It may be that the entire population could benefit from the experimental treatment equally irrespective of biomarker status, in which case enrolling only the biomarker-positive patients will result in slow trial accrual, increase of expenses and unnecessary limitation of the size of the indicated patient population. Concern over an ethical problem as we cannot include individuals in a clinical trial if it is believed that the treatment is not effective for them, as raised by the US Food and Drug Administration (FDA). It was based on the fact that the experimental treatment can only be approved for a particular biomarker-defined subpopulation (i.e., biomarker-positive patients) if a companion diagnostic test is also approved, and how the test can be approved if the Phase III trial does not show that the novel treatment does not benefit the biomarker-negative patients. The accuracy of diagnostic devices used to identify the biomarkers, e.g., biomarker assays, is not always correct. This can result in incorrect selection of biomarker-positive patients and therefore these patients will erroneously be enrolled in a trial yielding biased treatment effect estimates and consequential ethical concerns. For example, even when the experimental treatment works well for a specific subgroup, if the biomarker assay is not able to identify this subgroup robustly then a promising treatment may be abandoned.